What is the Tipping Point for Desktop Virtualisation? TechTarget’s SearchVirtualDataCentre.co.uk recently surveyed the UK’s IT professionals on virtualisation. What do these results mean for virtual desktop infrastructures (VDI) and desktop virtualisation technologies in the future? What is the tipping point for VDI and why are IT managers deciding to adopt a virtualisation strategy? Discover what desktop virtualisation technologies other IT professionals are seriously considering and hear the expert panelists analyse the emerging trends that are suggested in the survey and what end-users and IT managers should be focusing on. 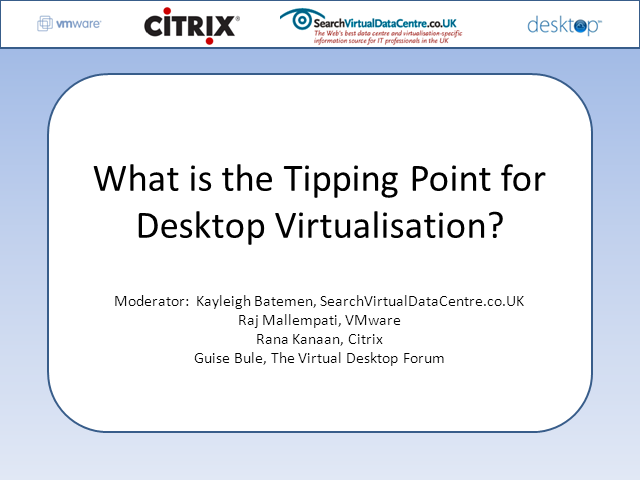 Title: What is the Tipping Point for Desktop Virtualisation?